You, as the owner of a company, may have a notion that once you have put in place customer service processes, you need not change them forever. This notion is wrong because the expectations of customers are not static. They keep changing very rapidly. This means that you should not only impart updated or modified customer service skills in your customer service employees but should change or improve the processes according to the changed circumstances. Why do expectations of customers keep changing? It is due to the advancements that keep taking place on the technological front the expectations of customers keep changing. Of course, these changes are fueled by the social media because social media spreads news and information at lightning speed. 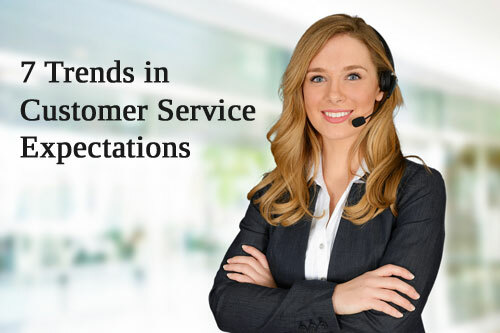 Let us now look at some of the trends in the expectations of customers. 1. Customers want to be served round the clock. Thanks to the advent of the Internet that can be accessed any time and from anywhere, customers want that they should be served round the clock, regardless of where they are. This is one of the important trends in the expectations of customers. This means that the systems you put in place should cater to these changed expectations. If you ignore this aspect, customers will not hesitate to move on to your competitors who may be offering such round-the-clock service. 2. Customers want to have efficient service. Though you may have imparted relevant customer service skills in your customer service team members and may have put in place several processes for serving customers, things may not work as planned. Things may go awry and this may cause frustration in your customers. What should you do to avoid such situations? The only way is to keep improving the efficiency of your customer service and your team members. One of the most appropriate suggestions experts make for improving efficiency in the aspect of customer service is to keep improving creativity in your employees. But how to improve creativity in your approach and in your employees? It is by educating them to avoid the temptation of developing attachment towards specific results. To elaborate this point, you may expect a certain result for a process you have introduced but the result you get may be different. Of course, the result you get may be equally satisfying. Remember that having attachment towards a certain specific result is capable of killing creativity. Another problem with developing attachment to certain specific results is that you may try to force the results by enforcing your decisions. Though it is not wrong to expect that your customer service employees should adhere to the rules of the systems you have put in place, you will shut down their creative brain when you try to enforce certain behaviors in them. The best way when you get a result that is different from what you have been expecting is to step back, analyze your actions as well as the result, use your creativity and that of your customer service team members, and come out with a more appropriate process that can get you the result you want. Not having a tendency to have attachment towards a certain specific result may be akin to the philosophy advocated by Viktor Frankl. He named his theory as “paradoxical intention,” and he wrote about this theory in a book that is entitled "The Unheard Cry for Meaning," that he authored. Paradoxical intention can be described as a theory that says that we are likely to miss a result that we strongly or forcibly set as a target. Though you cannot be sure about the certainty of this philosophy, the fact remains that by adopting the approach of not being attached to certain specific results, you can see vast improvements in your creativity. This will certainly lead to improved efficiency in implementing your customer service processes. 3. Customers expect to have prompt and quick responses. Apart from wanting to have round-the-clock responses, customers expect to get prompt and quick responses also from companies and suppliers like you. Now that the mobile technology is making huge strides, customers expect companies and providers to respond instantly. If there is any lacuna in your customer service systems or your approach, you should effect improvements in these aspects forthwith. 4. Customers are not satisfied with static e-commerce. Though the number of customers who buy online and through e-commerce sites has been increasing at a rapid pace, the trend now is they expect to have human interactions. Customers want their queries answered immediately by customer service rep and not by automated systems. You should therefore hire adequate number of executives and impart in them the relevant customer service skills so they will be able interact efficiently and promptly with customers. 5. Vague interactions will not do. Customers seem to have been fed up with ambiguous replies and responses. They want concrete results. This means that unless you provide them with the best and the most appropriate answers to their queries, or the best solutions that can solve their issues perfectly, you cannot expect complete customer satisfaction. Remember that customers who are not satisfied with your service will be grabbed by your competitors. 6. Customers are busy nowadays, and hence, they do not want to get in touch with you for correcting errors. Nowadays, everyone seems to be very busy. There may not be any person on earth who does not complain of paucity of time. This being the case, your customers will not have time to repeatedly contact you for correcting the mistakes you have committed in your responses, your answers to their queries, and in the solutions you have provided for helping them surmount the issues they face. So, you should be careful and should educate your customer service staff suitably. The customer service skills you impart in them should comprehensively cover all the salient points and information pertaining to your industry, your company, and your products or services. 7. Customers expect to have additional benefits. In addition to offering high quality products and the best services, you should make it a point to extend a few other benefits also to your customers. In face, the trend is that customers expect to have such benefits. For example, you can offer free shipping, generous discounts, the best warranty terms, etc. for impressing customers and converting them into loyal customers. If you keep these trends in mind and take appropriate steps, you can certainly take your company to higher levels.